Description: Depicted here is the normal anatomy of the conoventricular septum in the right ventricular outflow tract. The parietal band (PB) is inserted into the fork formed by the branching of the septal band (SB) to form its superior limb (SL) and inferior limb (IL). Note the proximity of the pulmonary valve (PV). Note on the inferior limb the insertion of a chorda from the anterior leaflet of the tricuspid valve onto the muscle of Lancisi. 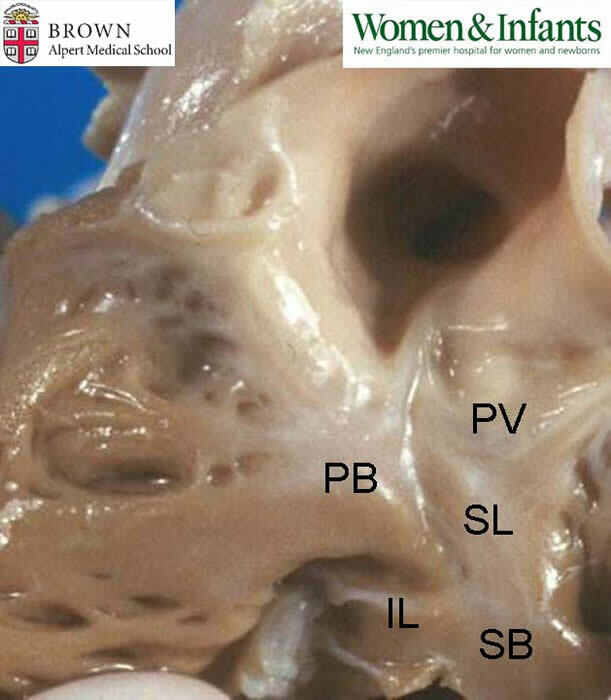 The portions of the SB and the PB interposed between the AV valve and the pulmonary valve compose the conus.